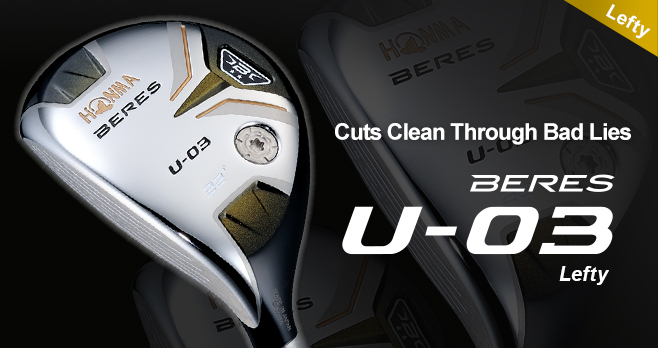 The head shape and center of gravity design create an easy-to-use, easy-to-hit utility club. The U-03 series features tungsten weights placed near the heel of the sole, providing greater manipulability and ease of contact. 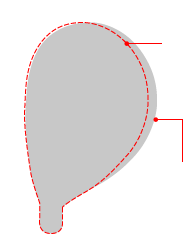 The rounded shape of the heel reduces catching, resulting in a clean-cutting head. 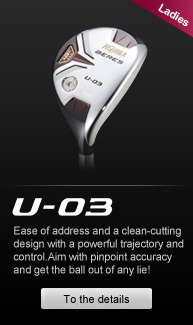 All clubs feature the same lowered CG design, enabling a gentle yet more powerful trajectory. Increasing the projected area of the club head increases ease of use at address and provides a greater sense of stability, making it easier to target the green. The projected area is designed to be slightly larger than in previous models, with a head shaped for ease of address and a greater sense of stability. The base of the heel has been dropped to achieve a more clean-cutting design. *Picture is for right hand product. Uniform weight placement across all clubs provides a lower center of gravity for a powerful trajectory. Tungsten weight screws near the heel also help to improve control and contact with the ball. *Spec data is Right hand model. Picture is for right hand product. Picture is for right hand product.